As I told you on a previous post, Last year I had the luck and joy of attending to a huge Latin-American scrapbooking convention held in Uruguay, the Paper Fest. 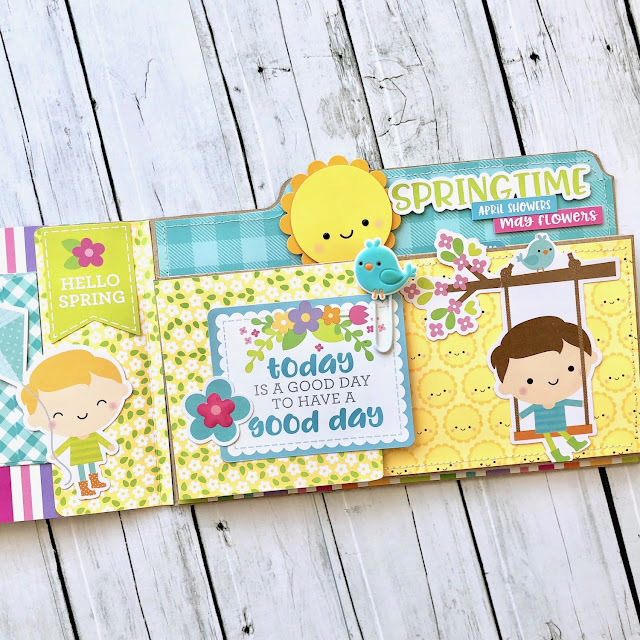 When I saw this notebook like patterned paper from Simply Spring collection my first thought was that it looked like a diary, so I used that idea for working on my layout. I worked a super simple two-columns design, with lots of embellishments. 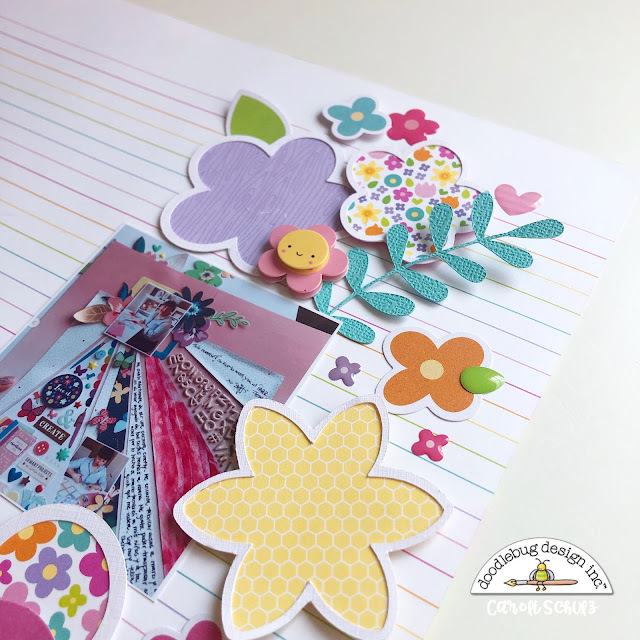 I cut some flowers using the cut files from Simply Spring collection and filled with patterned papers from the 6x6 inches pad. I prefer using smaller patterns for backing cutfiles, this way the pattern stands out better . 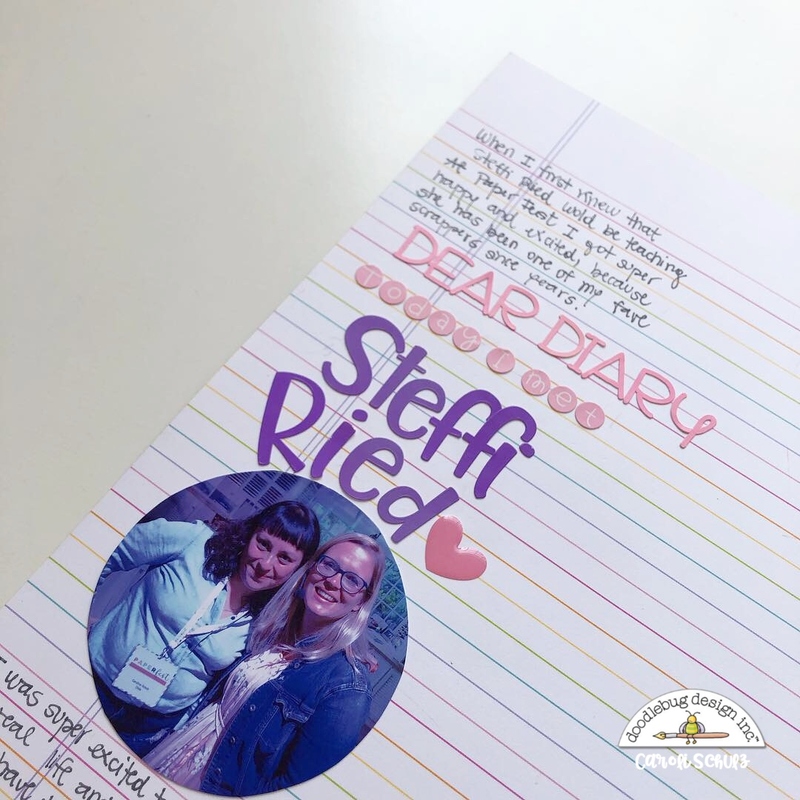 Of course I journal a lot about that day (you know how much I love to journal! ), how I felt, how wonderful the class was and what a sweet teacher Steffi is. I used a circle shaped photo because I love circles! 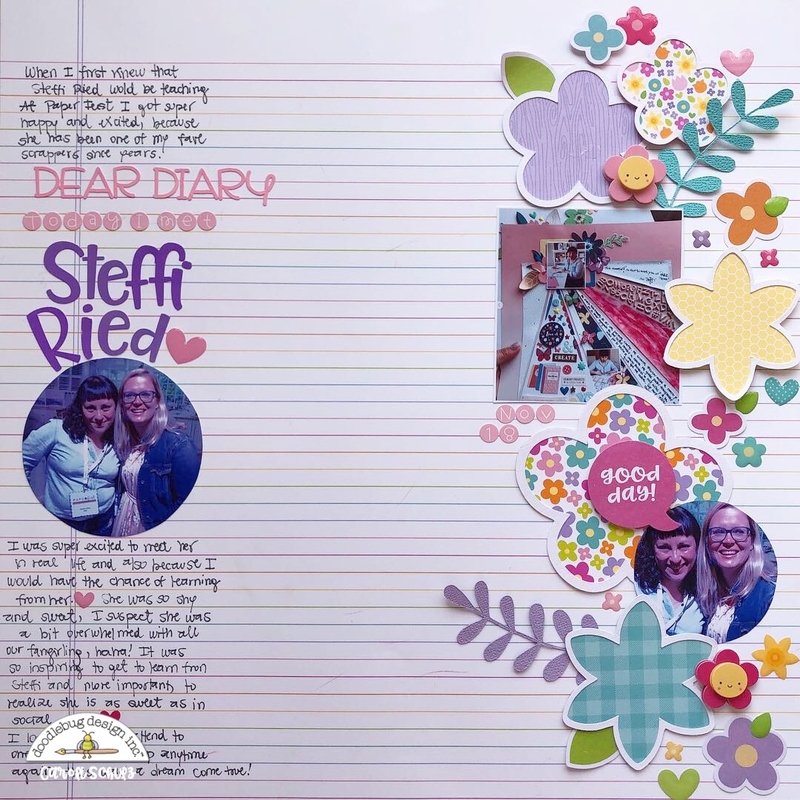 I am so glad I had the chance to meet one of my scrapbook idols and also I got to document it using this beautiful collection.This is what I love the most of scrapbooking, the possibility of living again wonderful days by documenting them. Do you have favorite scrappers? Have you had the chance to meet them or attending to their classes? Please tell me I'm not the only fangirl here, hahaha! Thank you for visiting the blog today, have an awesome time! Many of my recent posts have shown how I love to decorate the front pockets of my Daily Doodles TN. Today, I'm taking a different approach. My back pockets have been feeling quite lonely, so I decided to dress them up and show them off. I love how they turned out. I decided to use the cards from the Simply Spring Card Pack to design my back pockets. All I needed to do was flip them upside down and stitch the sides. Voila, they turned into a pocket. For this pocket, I added a die cut from the Simply Spring Odds and Ends pack. I tucked a couple of clips, some sprinkles and my washi tape card into the pocket. Then, I adhered it to the back of my last insert. To create my washi card holder, I used some leftover packaging. The cardstock from the Sprinkles was perfect. I adhered a piece of paper and a die cut to cover the text. Then I wrapped the washi around it several times. Now I can carry my washi with me wherever I go! For the back pocket of my notebook, I created a paper insert to tuck into the pocket at the top. I cut the paper to 4 by 10 inches, folded over the top part and tucked it into the pocket. Then, I adhered another stitched pocket to the paper. It makes a pretty background for the pocket and can easily be removed and placed into another Daily Doodle. I added some Chit Chats and Odds and Ends to this pocket as well. Using foam adhesive to pop up some of the elements gives it a great look. Now my Lots O Dots Daily Doodles is complete. It is decorated from front to back and is ready for Spring.Thanks for stopping by. I hope you got some ideas on how you might decorate your Traveler's Notebook. I love making mini-albums with little inter-active elements like pockets and flip outs. 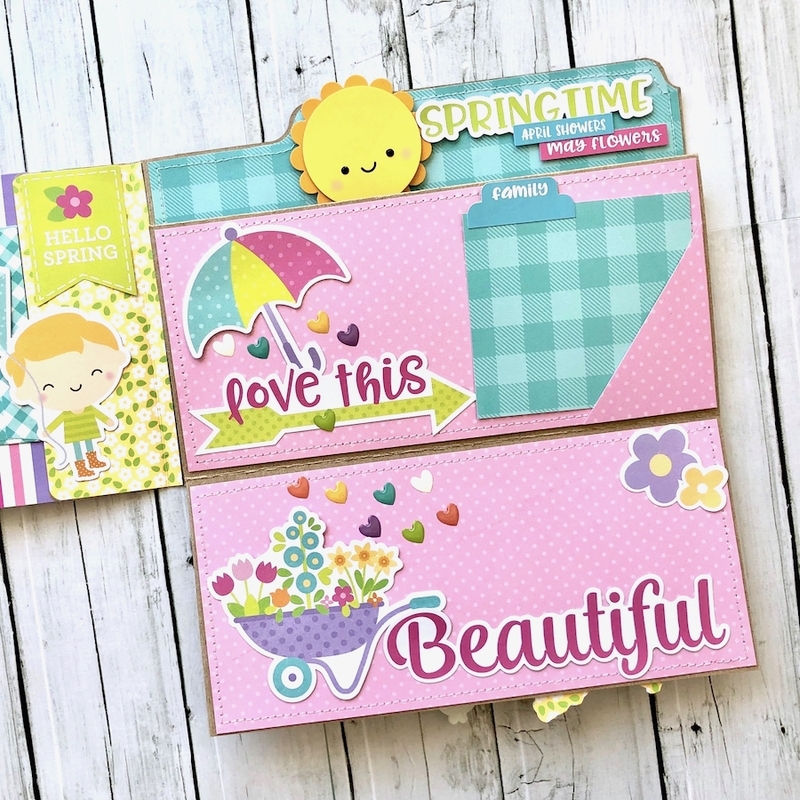 I've used the beautiful patterned papers and embellishments from the Simply Spring collection for my project. 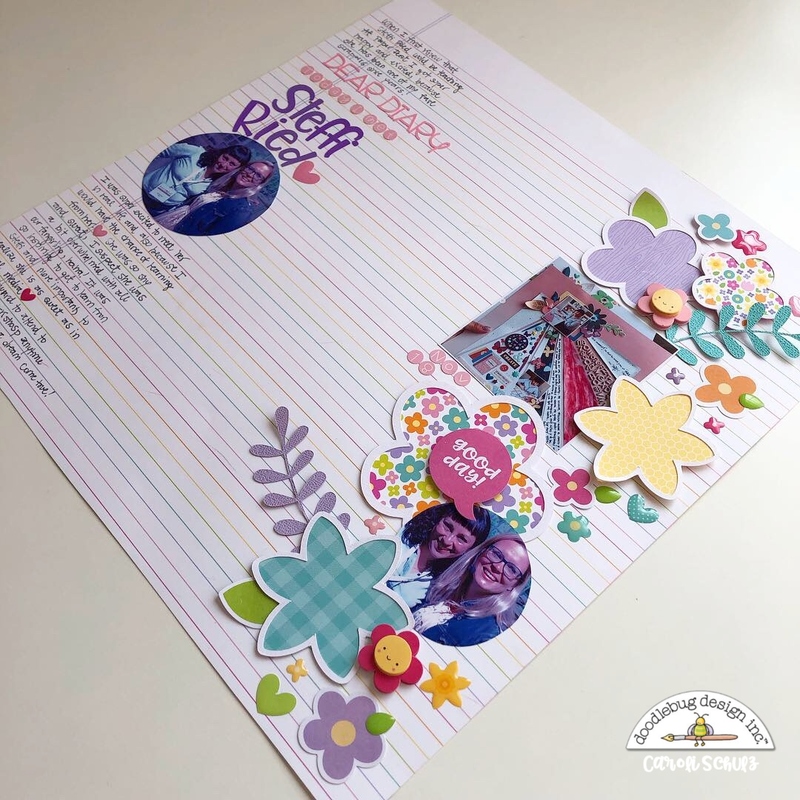 The mini-album I'm sharing today repurposes the regular file folder! 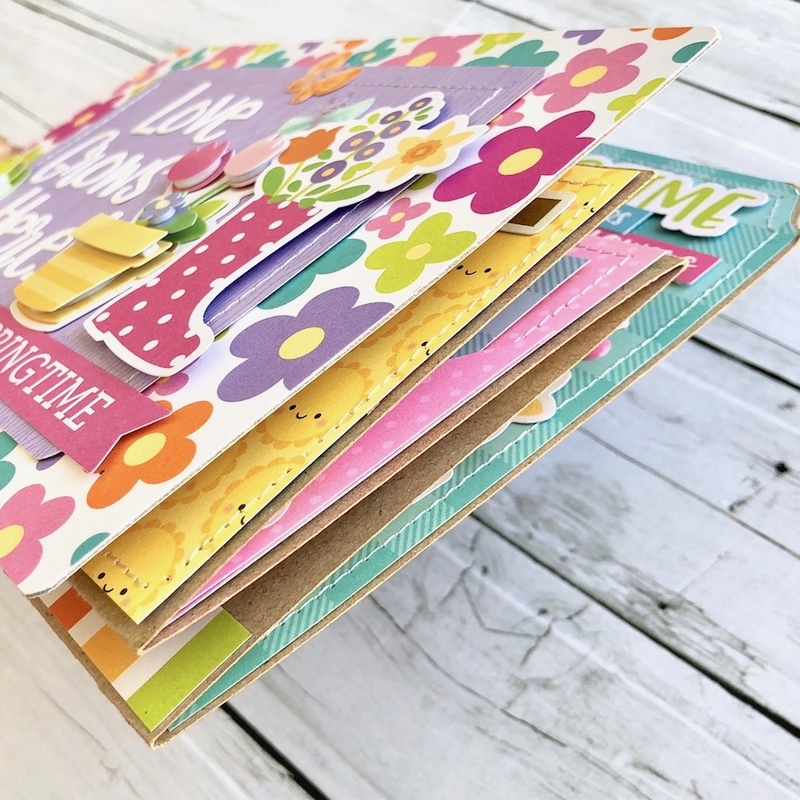 A file folder is strong and sturdy, it can hold up really well to being the base for a mini-album. I've included a simple tutorial template to show how the file folder is scored and cut to create the album base. There is an additional Step 7 to create the album cover. 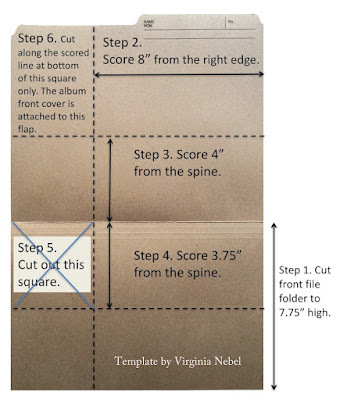 A separate piece measuring 8x5 is attached to the little flap (Step 6) to create your album cover. If you have lots of dimension in your album you may need to make a few vertical score lines to create a spine so that the album cover can close flat. Hope this inspires you to search out some file folders and craft your own mini album joy! 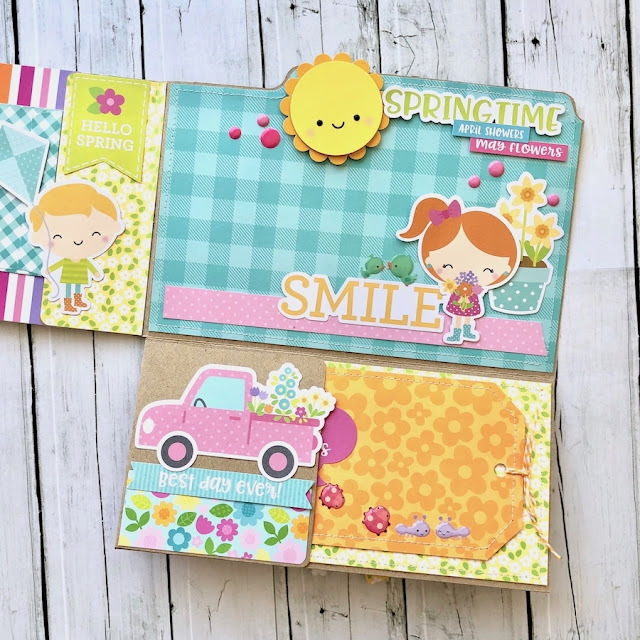 I love working with Doodlebug's cut files, they are absolutely the cutest and the Simply Spring collection is one of my all time favorites. It has pretty flowers, adorable kids and darling little bugs. The papers are wonderful, great designs and all the coordinating embellishments are simply delightful. 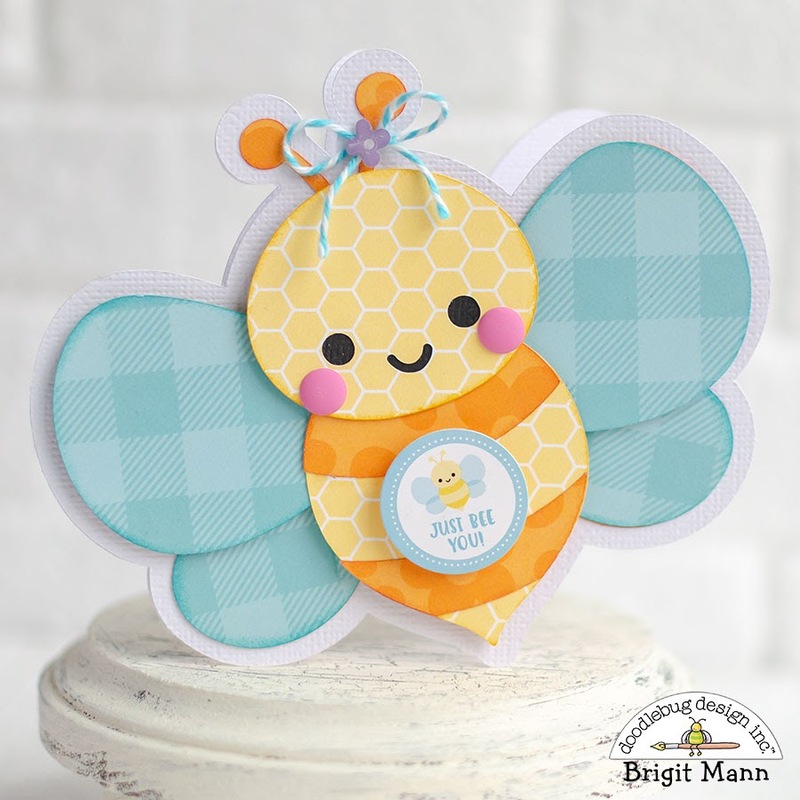 The bees (svg) are so sweet, though they both would make a great shaped card I chose the one with open wings for my gift set. I added some swimming pool twine, love matte sprinkles, a little flower from the may flowers sprinkles and a sticker from the this and that sheet. 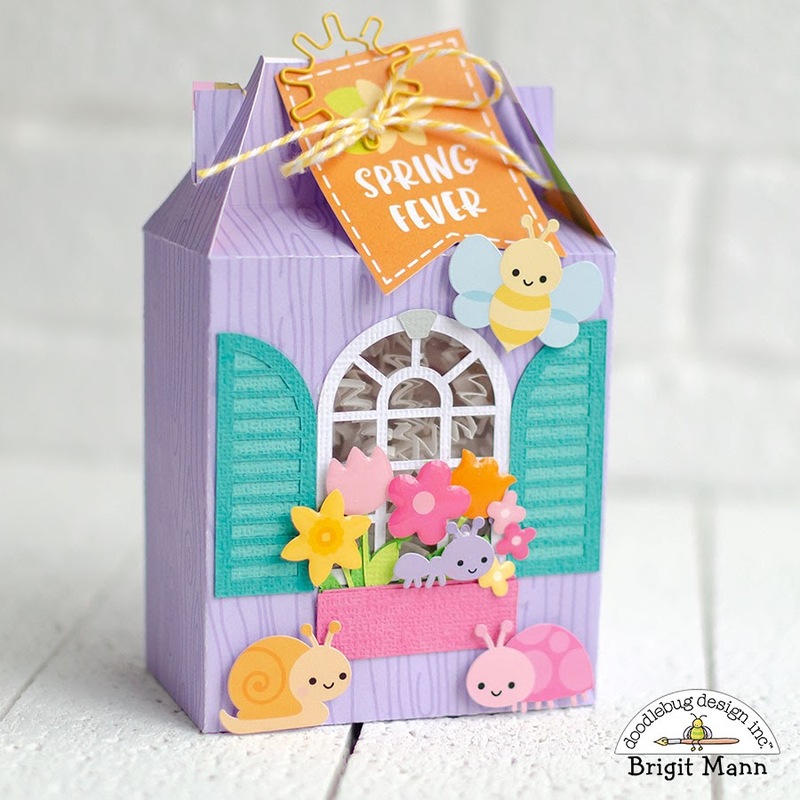 I used a treat box from the silhouette store and made a cutout using the simply spring window flower box, (svg, silhouette). 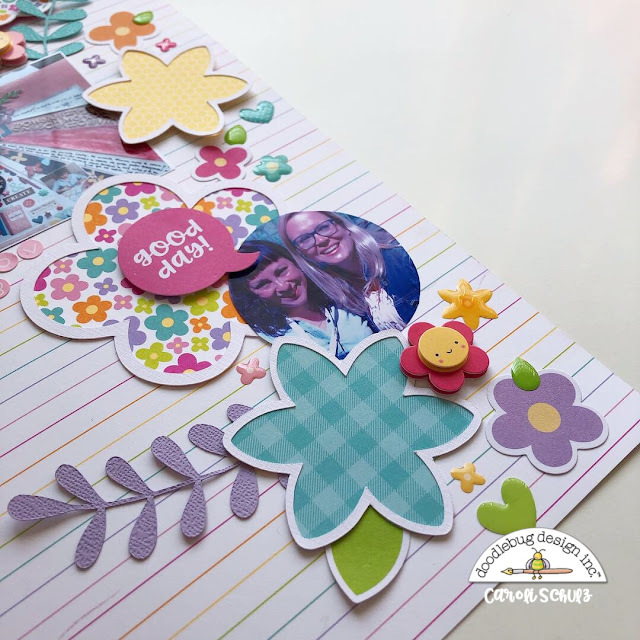 Instead of using the flowers in the cut file I replaced the with some may flowers sprinkles. I decorated the rest of the box using the icon stickers, chit chat, sunny sky clip, and bumblebee twine. 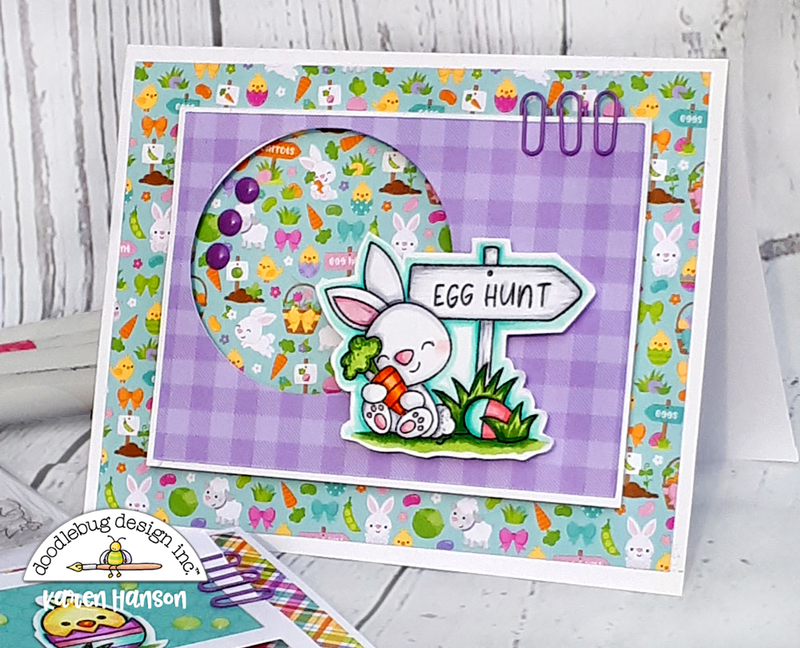 Here comes Peter Cottontail, hopping down the bunny trail...and right on to a new set of cards I created with the adorable Hoppy Easter collection from Doodlebug. With Easter fast approaching, there is still time to whip up some great cards, and this collection will make it easier than ever to send a card that will make them swoon! This little set actually features the papers from the 6X6 paper pad for this collection. 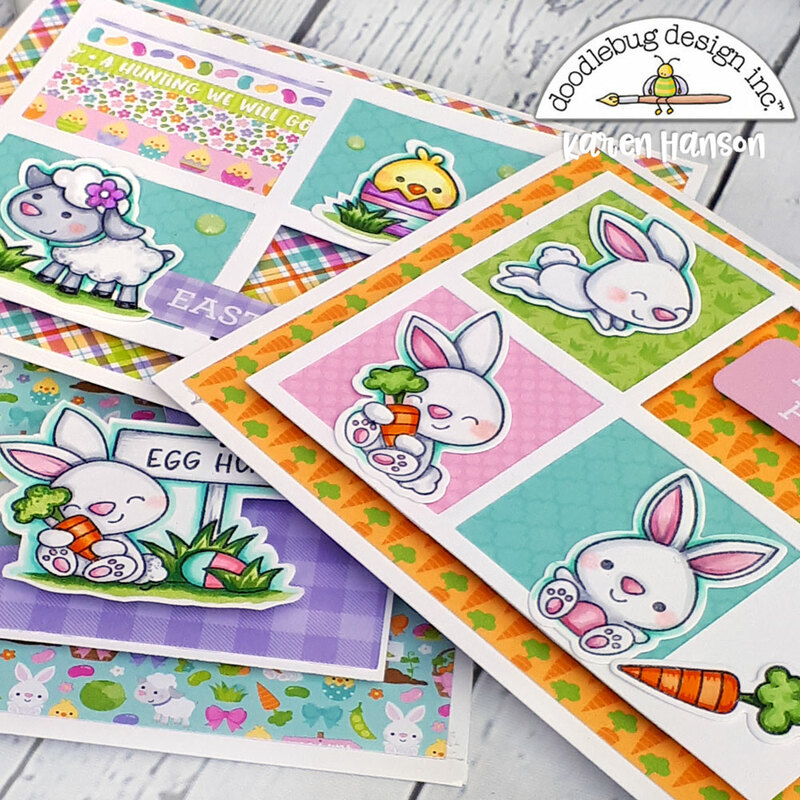 The icons in this collection are simply adorable and I wanted to feature them in all their cuteness alongside the stamps. The scaled down version of the patterns in the 6x6 was a perfect fit for the A2 cards. And the stamps - oh, the stamps! Can I just say that I could colour up these cuties everyday! 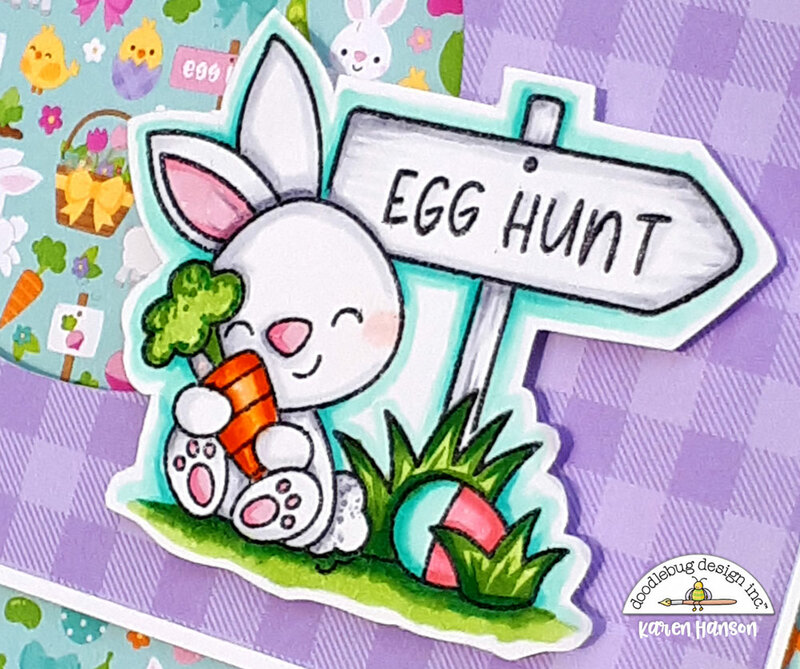 One of the great things about these stamps are all the little "accessories" that come in the set that allow you to create little scenes, like the grass with the egg and the sign post that I used in this image. 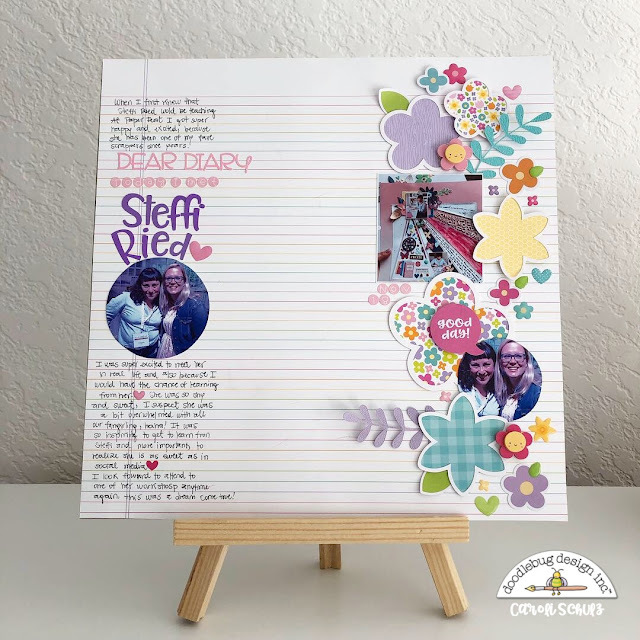 Created by masking and layering 4 different Doodlebug stamps, I was able to create a stamped image with a sentiment that was unique to this card. But if layering and masking is not your thing yet, the individual character stamps will have you swooning too! This little trio of bunnies was the perfect way to fill up some space on this card. 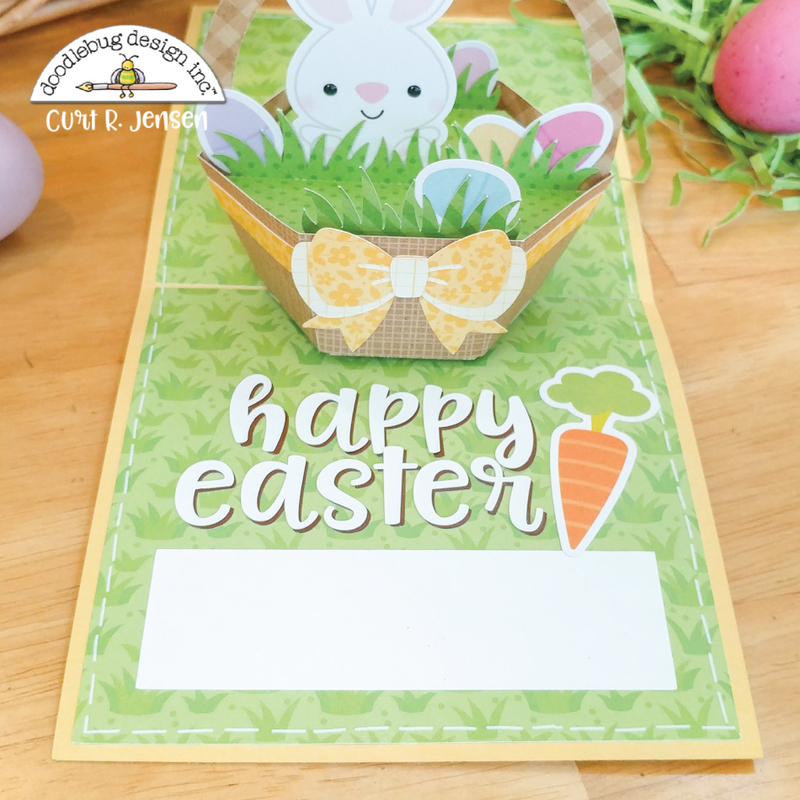 Together with a sentiment from the Odd and Ends pack, this little card was really easy to put together! I mean really - I know you want to colour him up?! 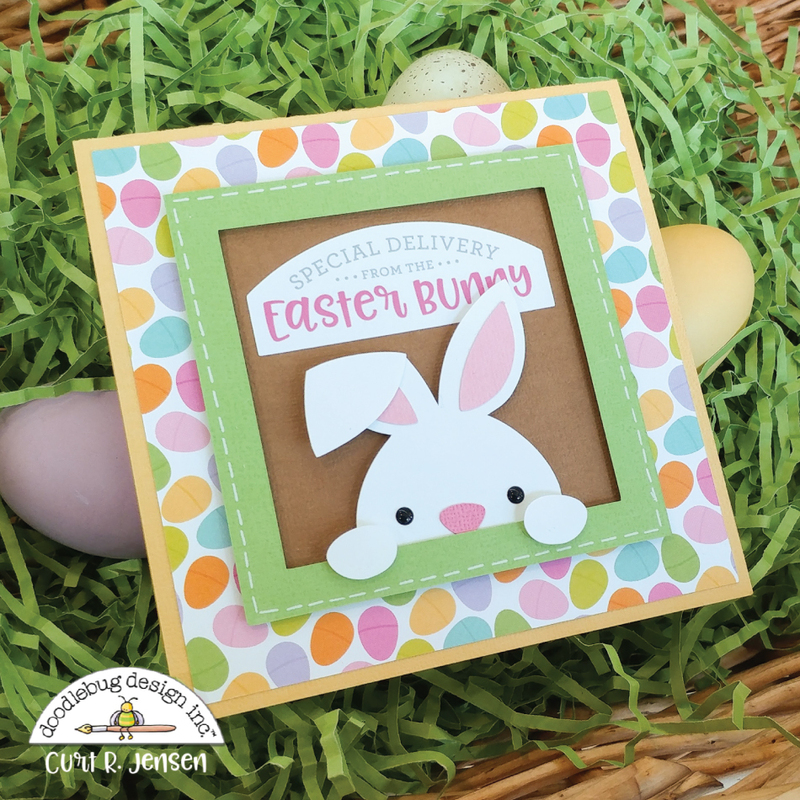 So I hope these little cards have inspired you to put together a cute set of cards to celebrate the Easter season. Whether or not you choose to give them away, well that is entirely up to you! Hello everyone and Happy Easter! 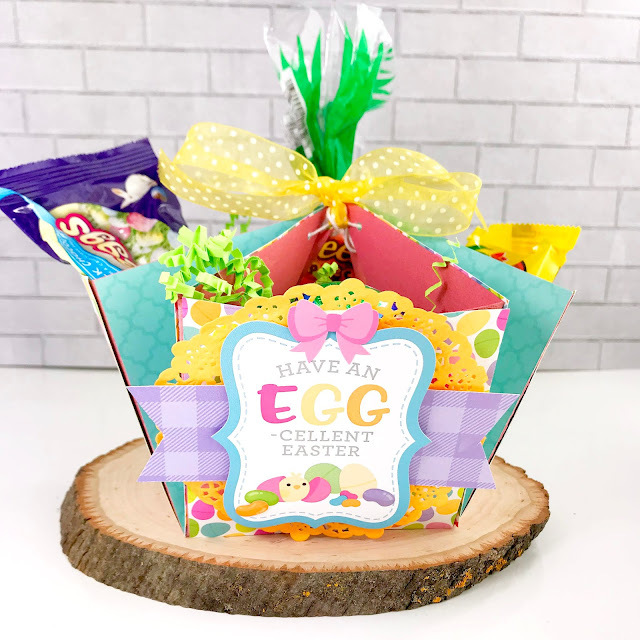 Today I wanted to share with you some quick and easy Easter treat holders you can whip up in a matter of minutes! 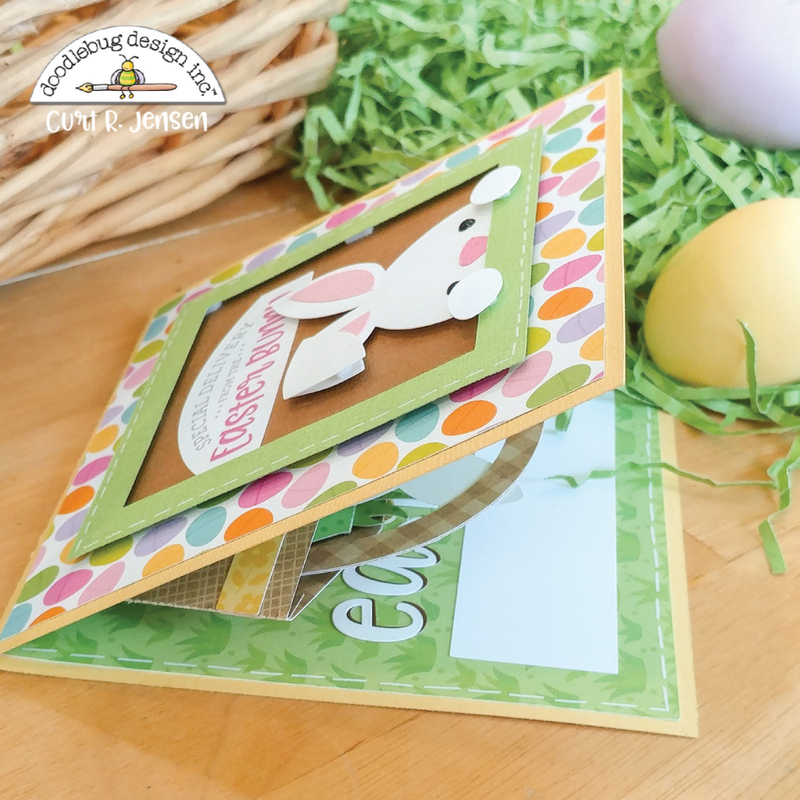 Today can be a busy day full of egg hunts, family dinners, and other fun festivities. If you want a quick and easy way to add some Doodlebug cuteness to some treats -I've got 3 treat holders you can whip up lickety-split! The first treat holder looks harder than it really is - just a few scored lines and some folding and you have a fun container that can hold oodles of treats! Here is the link to the tutorial used to make this holder: Gift Caddy. 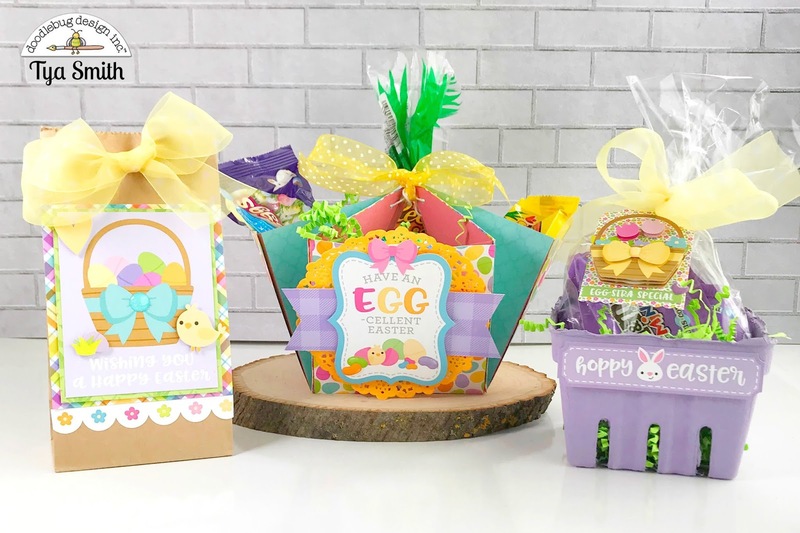 I used a 12 x 12-inch piece of Cupcake Textured Cardstock for the base and then decorated each of the panels with 4x4 inch squares of the Jellybean Plaid and some Easter Egg Hunt paper. I decorated the front panel with a tangerine doily, the sentiment is a sticker from the This and That sticker sheet and a banner from the Sunday Dress paper. I added a pink bow sticker from the Icon Sticker sheet and a few Jellies shaped sprinkles on the front. 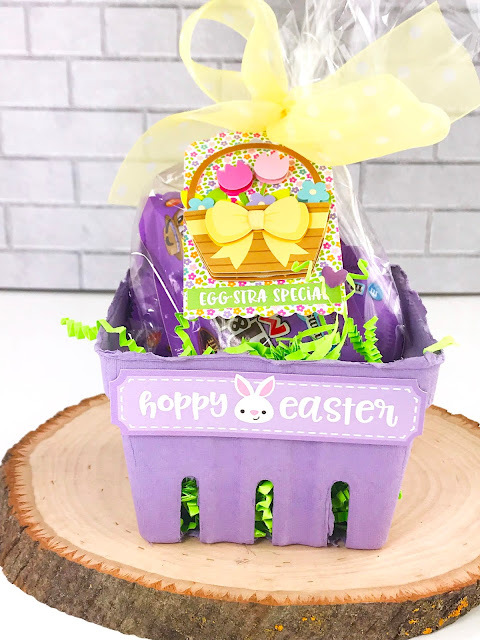 The next holder is a simple berry basket filled with some treats in a cellophane bag. 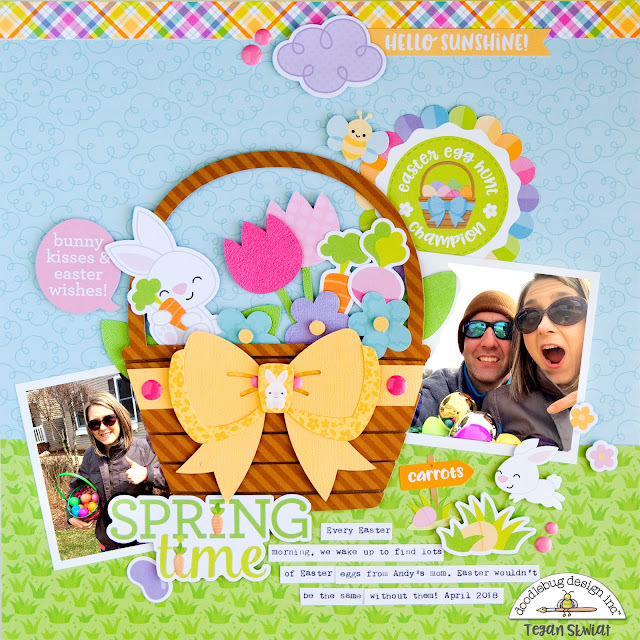 I decorated the front of the basket with the "hoppy easter" sticker which is from the This and That sticker sheet. I made a quick tag using a flower printed paper from the 6x6 paper pad. 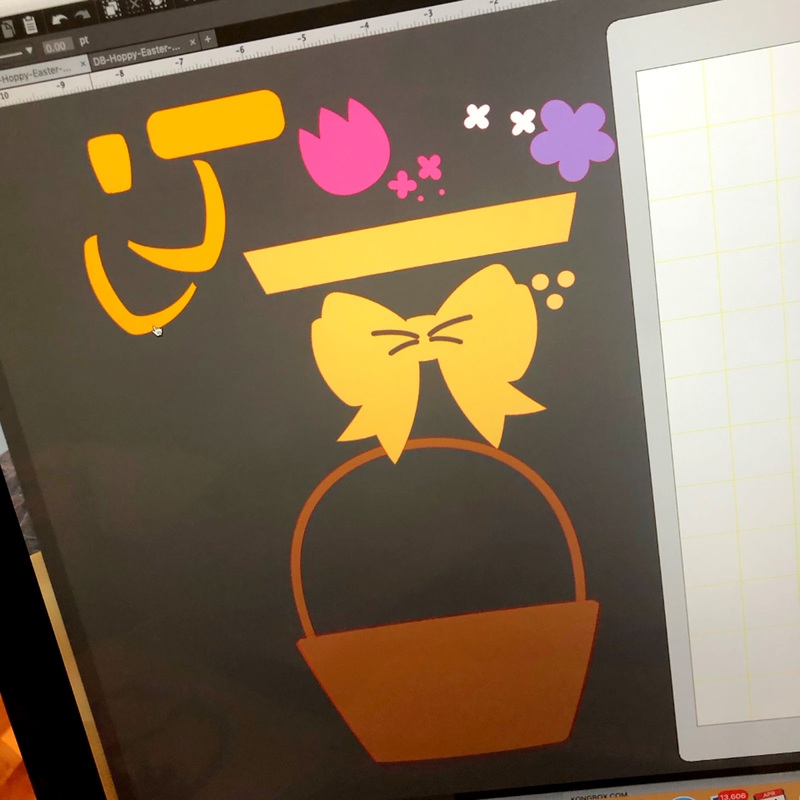 I added the Flower Basket Doodlpop to the tag and a small sticker sentiment from the This and That sticker sheet. I added a small purple heart sprinkle to the tag for some added shine. 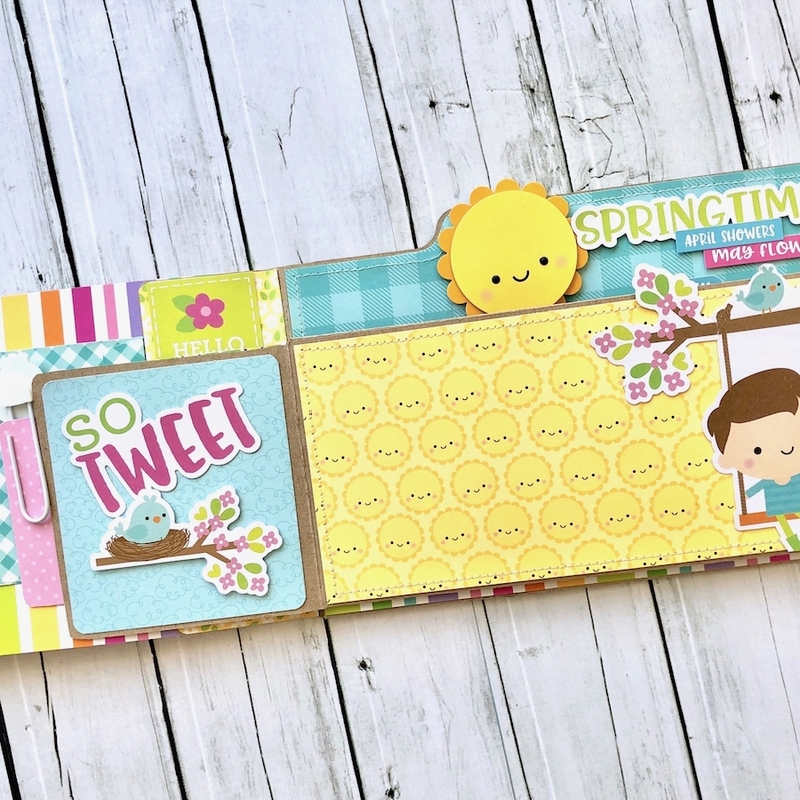 You can make oodles of tags in no time using Doodlepops and a few stickers. The last is a simple kraft paper sack that I decorated. I added a card from the 3x4 inch card side of the Sunday Dress paper. I backed the card with the grass side of the Easter Egg Hunt paper. I mounted these pieces on a piece of the Jellybean Plaid paper. I added a few stickers from the Icon Sticker sheet and the This and That sticker sheet. I added an aqua blue Glitter Sprinkle to the center of the bow on the 3x4 card. I added a scallop flower border from the This and That sticker sheet. I punched a couple of holes in the top of the bag and laced some sheer ribbon through the top. It was a quick and easy way to dress up a plain paper bag. That's all I have for you today! I hope you all have a wonderful Easter holiday full of family, festivities and a little fun! These cute treat holders are just what you need to add that special little something to your treat bags. Happy Crafting! This year, the Easter Bunny has hidden your Easter basket in the last place you'd ever think of looking for it . . .
. . . 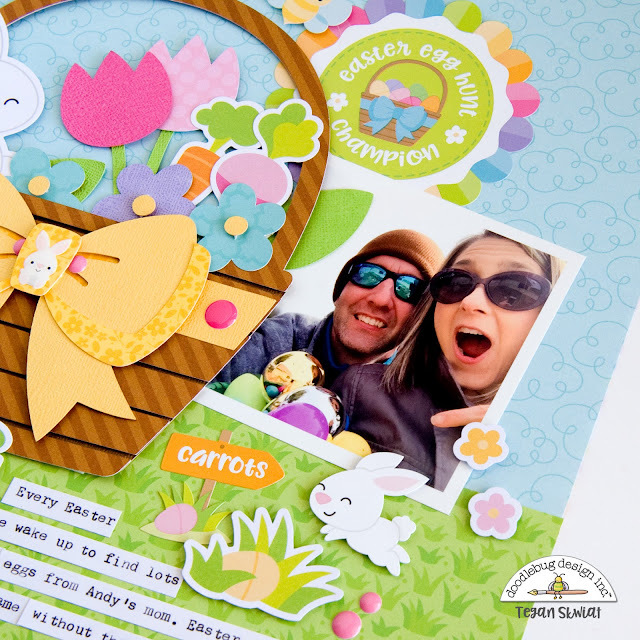 INSIDE your Easter card! 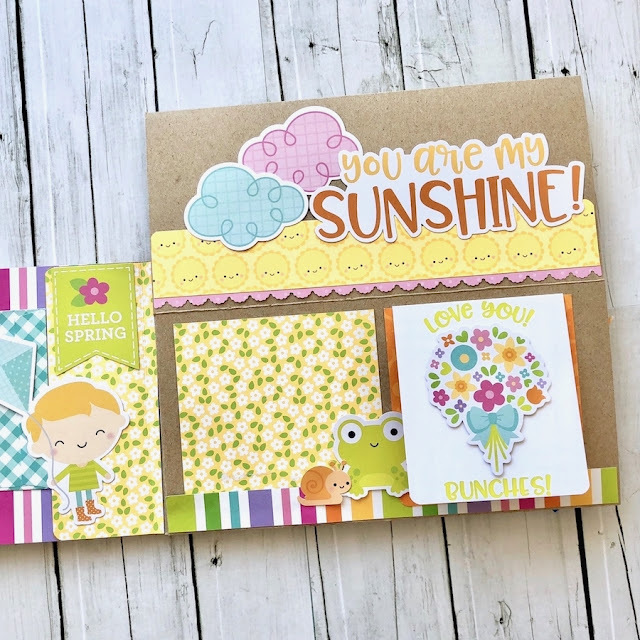 Why should the outside of your card have all the fun!?! 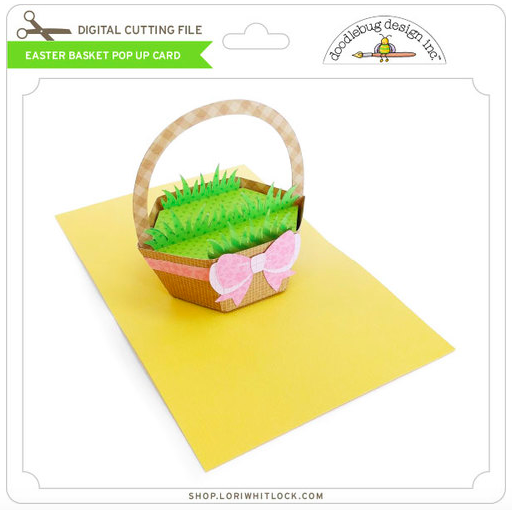 The SVG cut file for this Easter Basket Pop-Up Card is available exclusively from Lori Whitlock. After I cut and assembled the pop-up, I filled the Easter basket with Hoppy Easter Odds & Ends. Then, I layered two colors of Abigail alpha stickers on top of one another, Lily White and Bon Bon, to make my sentiment stand out! For a finishing touch, I added faux-stitching around the perimeter with an oldie-but-goodie, the Sew Easy rub-ons! Visit my blog to see how the Easter Basket Pop-Up is made step-by-step. 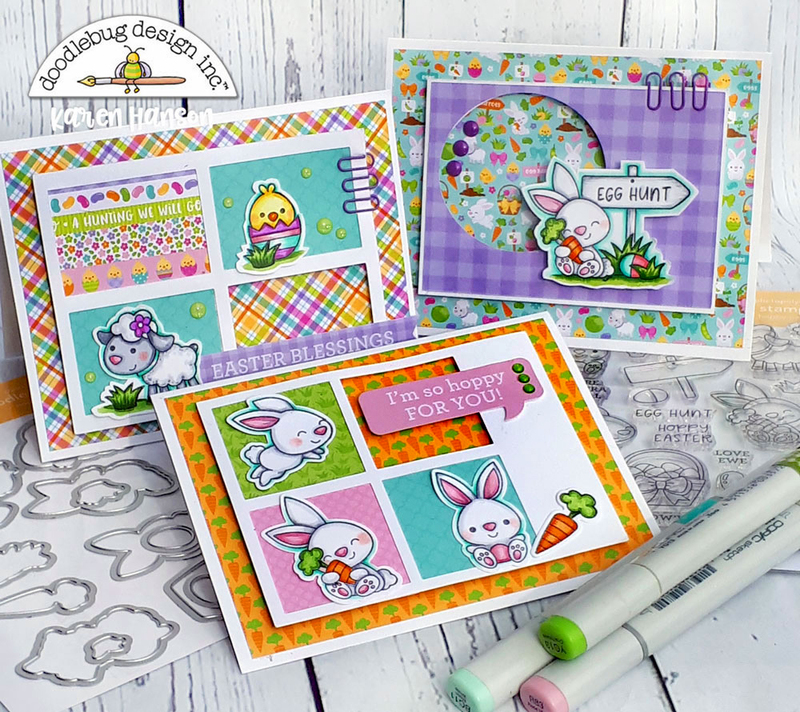 Hi all, Barbara here and I’m back today with more projects using Doodlebug Design Hoppy Easter Doodle Stamps and Doodle Cuts. Gosh, I had so much fun making them! First up, look at this cutie patootie bunny hugging his carrot!! 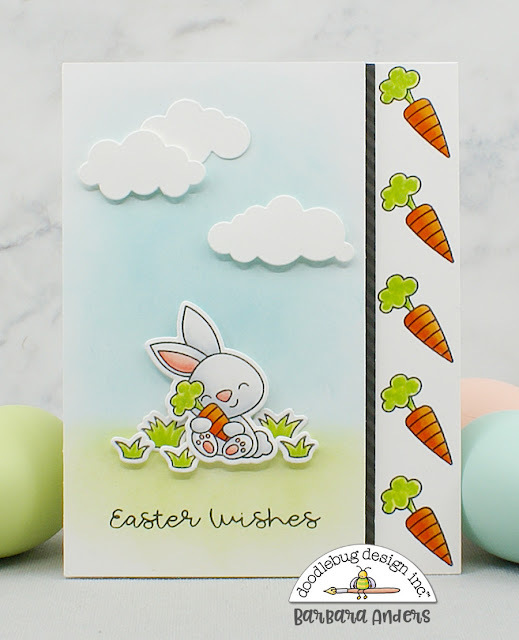 To begin this card I stamped a row of carrots down the side of a white card stock base with Copic-friendly ink and colored them with Copic markers. Next I stamped up the images the same way, cut them out with the coordinating dies, and colored them as well. Then on another panel of white card stock, I sponged the background ink and stamped the sentiment. Then I popped it up on the card base with a strip of Beetle Black Dot-Stripe Petite Prints cardstock. To finish I popped up the colored images and some clouds to finish the scene. My second card required a bit of masking and I’m so tickled with how it turned out because I LOVE these little jelly beans!! I stamped them, masking as I went, with Copic-friendly ink until I had a pile that I liked along with a few still falling. I colored them with Copics in Doodlebug colors, gave them some grounding, and adhered the panel on foam tape on the card base, which was covered with paper from the Hoppy Easter 6 x 6 paper pad. 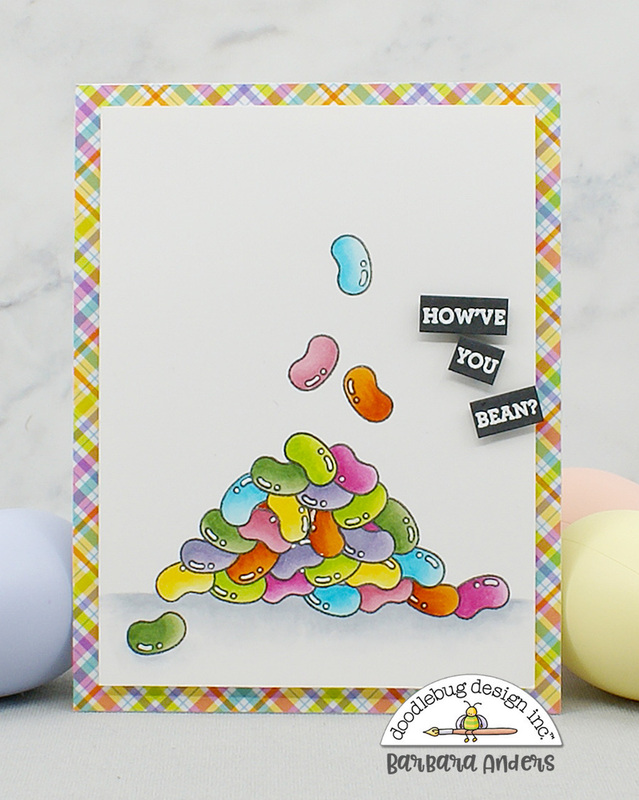 The sentiment was heat embossed on black card stock and arranged to mimic the falling jelly beans. Fun! Lastly, I have a couple of tags. Wouldn’t these be awesome on a kid’s Easter basket? I created mini scenes on them using Hoppy Easter Washi tape, 6 x 6 paper pad, and of course images from Hoppy Easter Doodle Stamps and Doodle Cuts. The images were all colored with Copic markers and adhered either directly or on foam tape for dimension. Some ribbon and Doodle Twine finish the top off. 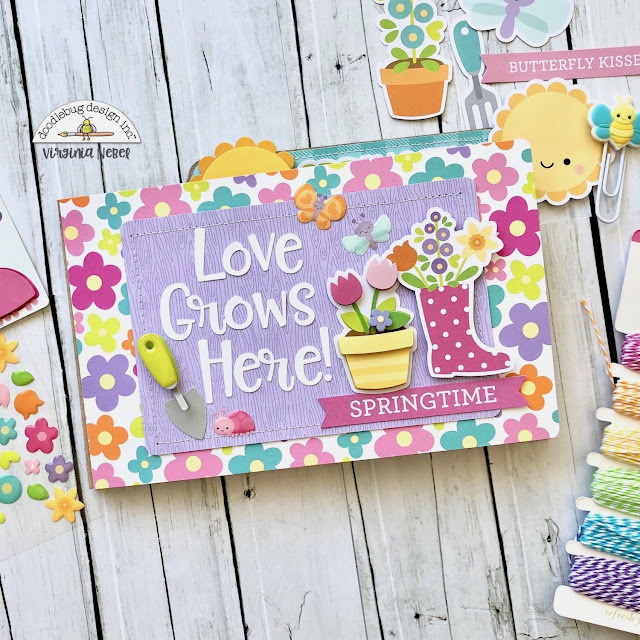 What do you get when you pair the Doodlebug Design Hoppy Easter Basket of Flowers cut file with the Hoppy Easter and Simply Spring collections? A basketful of cuteness - that's what! The cut file and these collections were perfect for helping me document the yearly yard full of Easter eggs my mother-in-law puts out for us to find on Easter morning! ​Don't let the number of cuts of this design overwhelm you. The Doodlebug Design cut files have all of the different sections colored in, which makes it super easy to keep the pieces organized. I simply grouped all of the parts together by color and then cut out each color group. Assembling and then 'filling' the basket was so much fun! 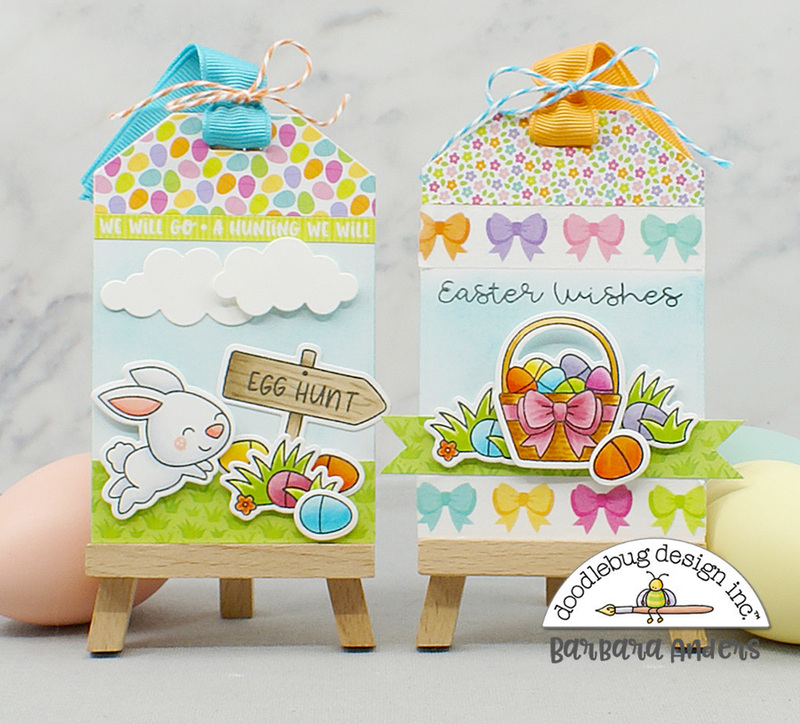 ​I used the Petite Prints Stripe patterned paper in Bon Bon on the basket to give it a faux wood look. 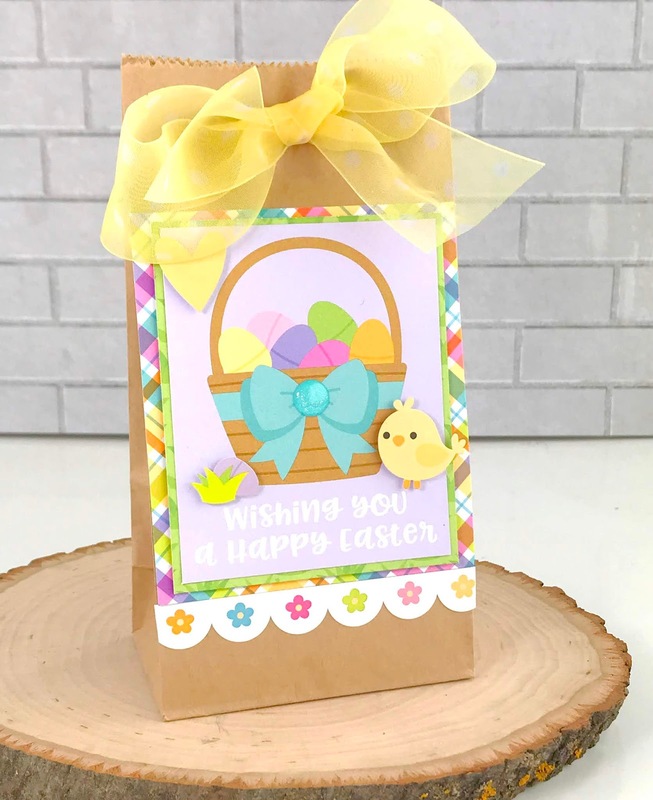 I used Doodlebug cardstock and patterned papers from the Hoppy Easter collection for my flowers. I used Doodlebug Design cardstock and the Petite Prints Floral paper in Bumblee on the bow. Sprinkles add even more cuteness! 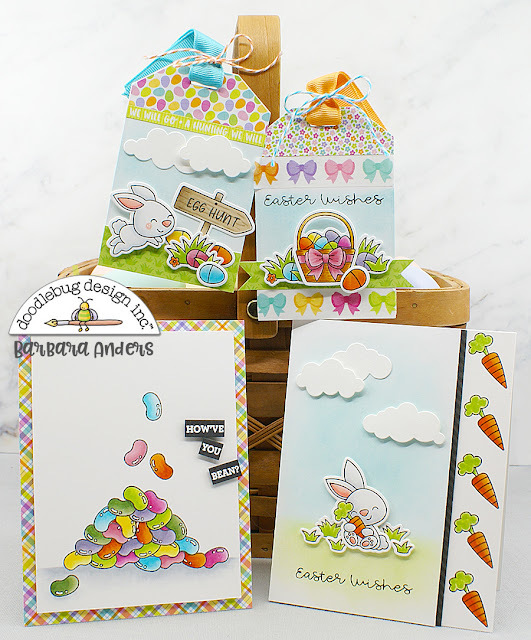 Once my basket was complete, I added the adorable bunny, carrot, and radish Odds & Ends pieces. 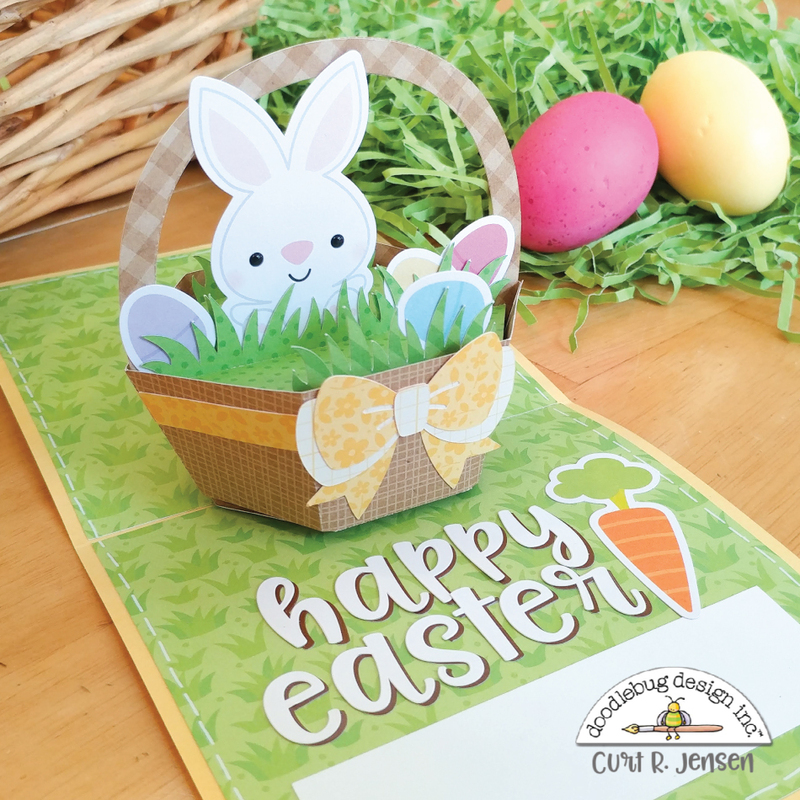 How cute is that little bunny sitting in the basket?! ​I finished off the layout with the rainbow wheel This & That sticker, more Odds & Ends pieces, and a couple Icon Stickers. I can't get over how cute that little bunny hopping through the grass is! ​Thank you for joining me today! 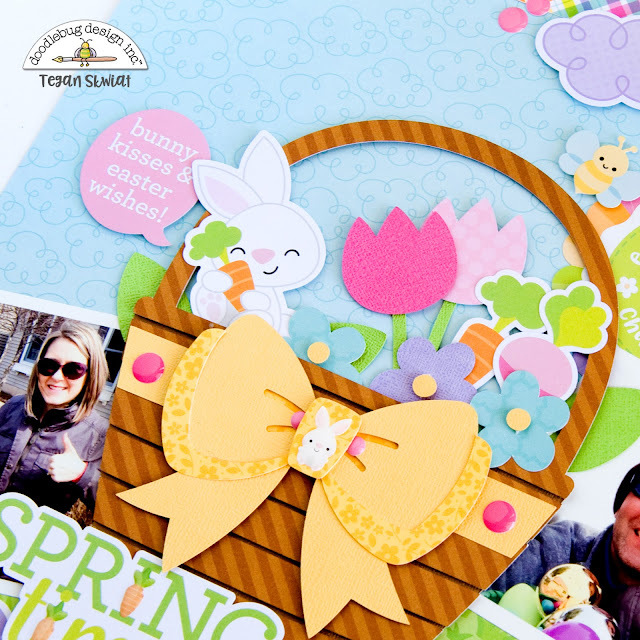 I hope I have inspired you to use a large cut file with the Hoppy Easter collection on your next layout!